You’ve heard of beer, and you’ve heard of yoga. But have you heard of beer yoga? 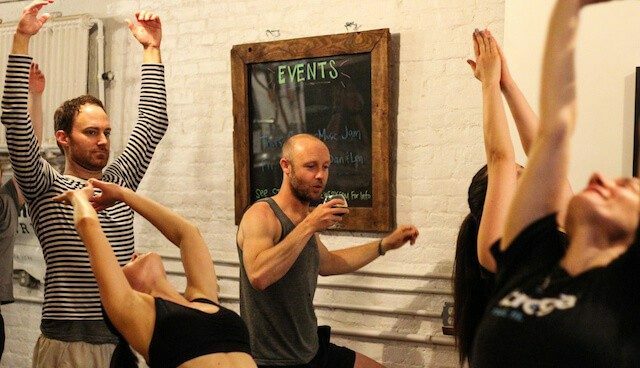 Beer yoga has been a growing trend over the last few years, slowly stretching across the nation and unsurprisingly, it didn’t take long for it to arrive in New York. When this author spotted the staggering trend in 2015, it was unclear whether beer yoga was a fad that was too good to be true, or too ridiculous to persist. But folks, it looks like it’s here to stay, only growing in popularity since that summer. The best part is, it’s surfacing at some of our favorite breweries in Brooklyn. The best yogis, like the best beer nerds, are the ones who don’t take themselves too seriously. 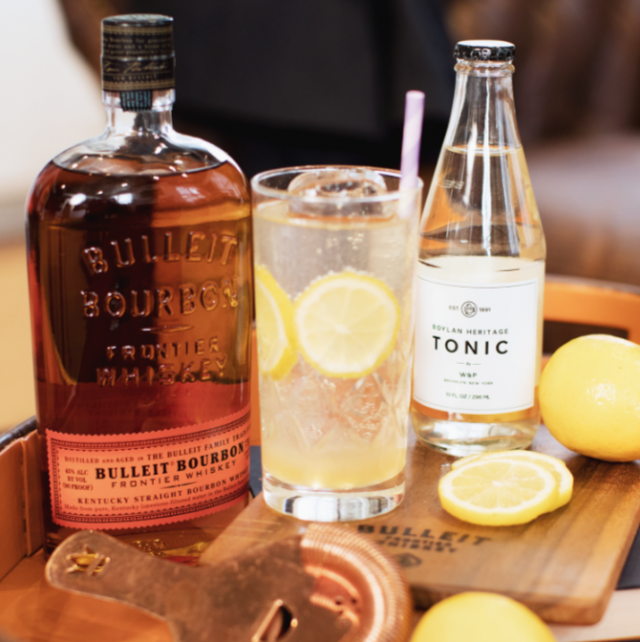 In the best case scenarios, combining popular pastimes like these brings like-minded, chill people together to kick back—or up, or sideways—and have fun. 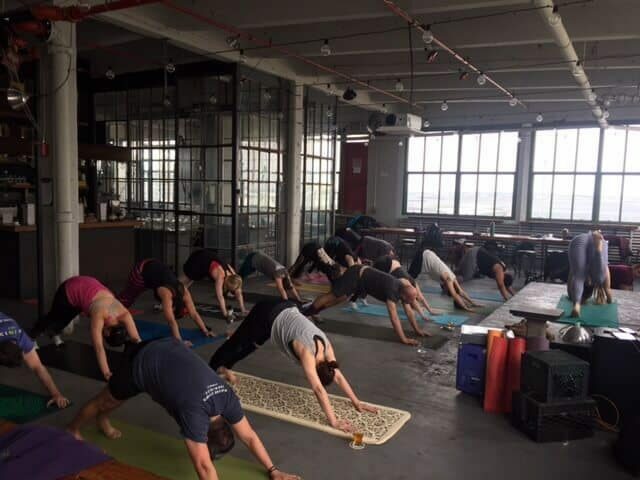 Here are five places to find the best beer yoga in Brooklyn. 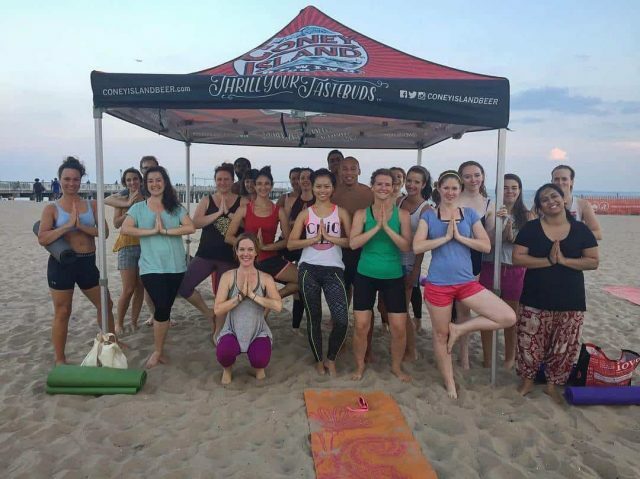 Every Wednesday, Coney Island Brewery hosts Mindful Pints: Yoga and Beer for sunset yoga on the beach, a beer yoga experience that beats the rest in terms of price and location. Each class takes tipsy troops to a sunset yoga class on the beach, followed by a pint at the brewery, all for just $5. After you’ve redeemed your free yoga class and $5 pint, beers are offered at happy hour prices for $2 off for yogis ($5 per pint, as pints are usually $7). Or, for Brokelyn Beer Book holders, you’ll get a second beer free. Class starts at 7pm, but plan to begin your journey at the brewery no later than 6:50. No matter your judgement, gender identity, or flexibility, the Broga vibe promises to be “comfortable and challenging,” according to this very chill video. 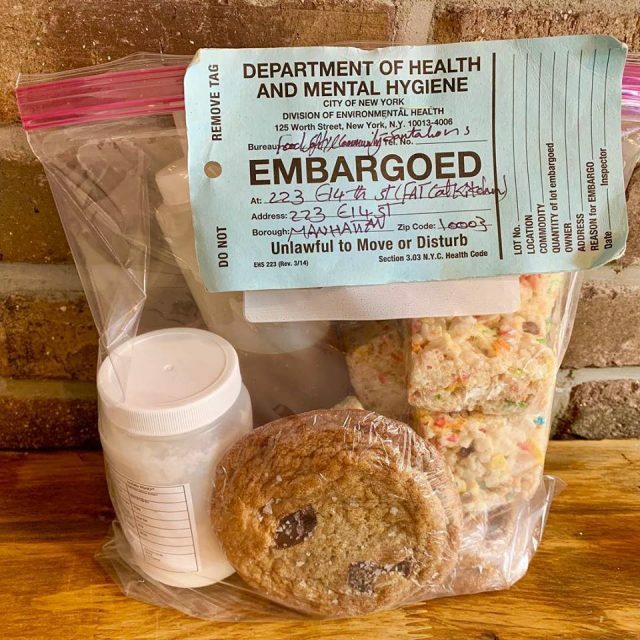 One attendee also described the class as “very, very exhausting,” so you know, everyone’s different. But, no matter the journey, the reward is the same: beer. BYO mat, water bottle, and towel. And bring your Beer Book for a free beer after class! Wartega Brewing got in on the beer yoga trend thanks to body positive babe/blogger, NY Foodgasm, who created the Beer Fit Club, a women-owned company that combines the partners’ two passions: beer and fitness. With an emphasis on having fun and feeling fine, the Beer Fit Club’s beer and yoga classes go the extra beer mile: Unlike classes that reward you with a beer after class, this one incorporates the beer into a vinyasa flow, so you’re sipping and stretching all class long. “I came up with the idea to incorporate the beer instead of waiting until after and she [Rose Fava, “Chief Yoga Officer”] ran with it,” said NY Foodgasm and Beer Fit Club founder and CEO, Sophia Del Gigante. “The drunken warrior sequence is my favorite. We go into warrior one with the beer in hand, to warrior two, and then peaceful warrior [to] sip,” she told Brokelyn. You can learn more about the team here, including Gigante’s personal and astounding journey—she lost 73lbs bringing beer into her exercise routine. See? Beer is good for you. 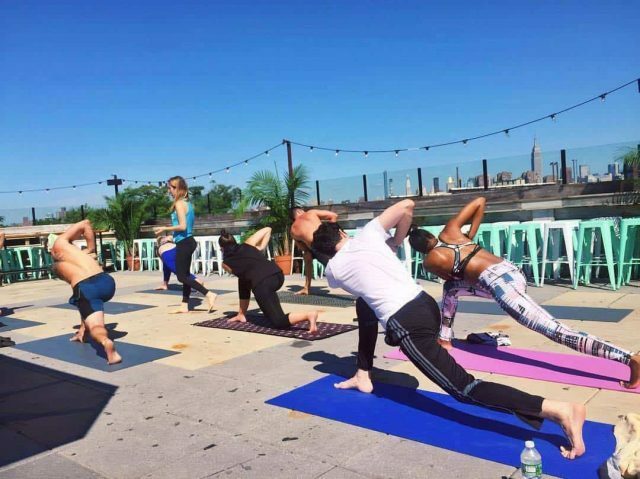 As one of the first beer yoga proponents in Brooklyn and the country, Brooklyn Brewery has put on beer yoga events with the likes of Hosh and others. Their next beer yoga event is scheduled for October 17, though details have not yet been firmed up. 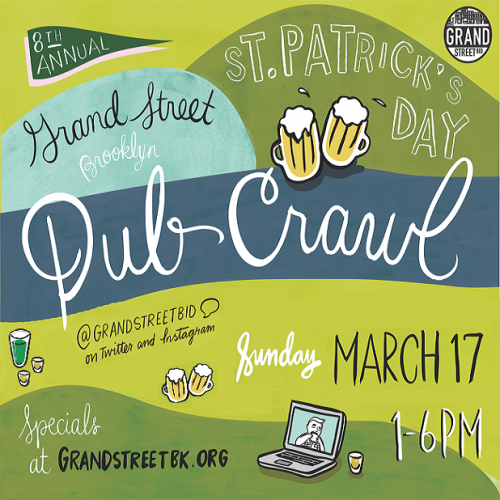 Check their events page or follow Brooklyn Brewery on Facebook and Twitter for updates. Run by Surf Yoga Beer and hosted every Sunday, Northern Territory, Rooftop Yoga at Northern Territory brings sun salutations to the next level atop the Australian-themed bar and restaurant. Their next class is scheduled for Sunday, August 20 at a bright and early 9:30am. To those capable of saluting the sun that early on a Sunday, we salute you. 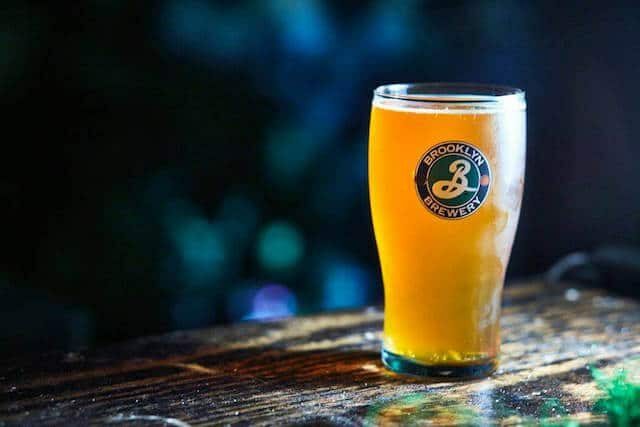 Free minds pair well with free beers: don’t forget your Beer Book at Brooklyn Brewery, Coney Island Brewery, Strong Rope Brewery and Wartega Brewing. there’s also one @ Bronx Brewery this Saturday 08/19!